As business moves faster, we're all using mobile devices to keep pace - changing how we work, and in many cases, where we work. Ricoh continues to do its part, with new innovations offering more freedom and agility, so you can perform more everyday tasks in less time. The RICOH SP C252DN Color Laser Printer offers standard wireless printing and mobile printing capabilities so you can access information where you need it, when you need it. The SP C252DN offers high-quality laser printing for small offices and workgroups in a compact footprint so you can place it anywhere from retail counters to executive offices. You can even include the SP C252DN as part of a Ricoh Managed Document Services (MDS) strategy and measure how much time and money it can save for your organization. Print two-sided documents with standard automatic duplexing and reduce paper use, energy consumption and overall costs. Replace top-loading AIO print cartridges in seconds without IT support. Return depleted cartridges for recycling at no cost. Accommodate thicker paper stocks with up to 42 lb. Bond/83 lb. Index and meet a wider range of print demands, including labels, transparencies and envelopes. Install the optional 500-sheet Paper Feed Unit beneath the printer and increase paper supply to 751 sheets without increasing the footprint- making it ideal for home offices, cubicles, kiosks and retail counters where space is limited. Handle special or single-page jobs with ease without having to reconfigure paper sizes in the Bypass Tray. Manage printer functions, error conditions and maintenance settings with the intuitive, easy-to-use control panel. Support a variety of network environments with PCL and PostScript 3 emulation including both Windows and Macintosh network environments, IPv6 and Bonjour applications and Citrix MetaFrame distributed print environments. Connect quickly and print images directly from a PictBridge-enabled digital camera using the standard USB 2.0 interface. Protect information- and your budget. Access to system functions and page volume limits can be set with User Restriction controls. Using Locked Print can help secure confidential information. Manage printer network settings, fleet utilization and check consumable levels remotely with Web Image Monitor. * Declared yield values in accordance with ISO/IEC 19798. Actual yields may vary based on types of images printed and other factors. The Ricoh SP C252DN ships with a set of four starter All-In-One print cartridges yielding 1,000 pages each. All other consumables ship at full yield. For maximum performance and yield, we recommend using genuine Ricoh parts and supplies. Specifications subject to change without notice. 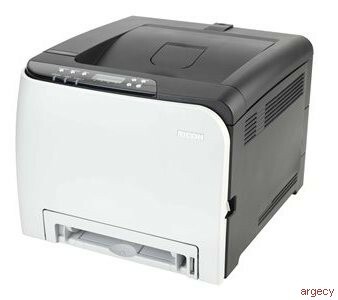 The Ricoh SP C252DN is under warranty against defects for a period of one year from the date of purchase. Consumables are under warranty for a period of 90 days from the date of purchase or until depleted, whichever comes first. Please refer to warranty documents shipped with the product for more details.